In a short time Phil Dike (1906-1990) had made an extraordinary amount of progress as a painter and was enjoying an unusual amount of national attention for an artist only 28 years of age. Much of this attention was due to his involvement with the California Water Color Society. In addition to Dike, Millard Sheets, Lee Blair, Hardie Gramatky, Emil Kosa, Jr., Phil Paradise, Milford Zornes, Paul Sample, Barse Miller, and others were enthusiastically exploring new ways of painting with transparent water colors on large sheets of hand-made paper. On a weekday drive to Pasadena, you might find Paradise and Kosa painting under one of the bridges that spanned the Arroyo Seco, Paul Sample doing a waterfront painting at Terminal Island or Dike, Sheets, and Fred Penney painting watercolors of the gaily colored houses at Chavez Ravine. Their main objective was to visually capture and communicate the magnificent California light and color. For this purpose, they unanimously agreed, transparent watercolor paint was the preferred medium. During this era Dike was one of the leading figures in the watercolor movement. 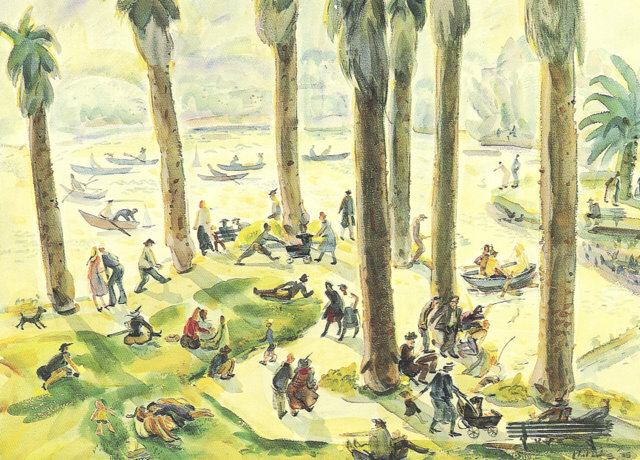 Between 1927 and 1955 he exhibited more paintings in California Water Color Society shows than any other single member. Two of his works won the Society purchase prize and are now in the permanent collection of the Los Angeles County Museum of Art. In 1939 he was president of the Society. This was a little known resort on the outskirts of Cathedral City, almost obscured by a thicket of greasewood and other hardy plants. In one of the custom-designed cottages, the Dikes could relax alone or enjoy the company of other well-known writers, composers and artists who were also in seclusion. Dike took the time to “rest in action.” He wrote and illustrated books solely for the enjoyment of his small son. He illustrated books for other authors, designed covers for Westways magazine, made sketches of the surrounding area, and on occasion painted with watercolors and oils. Many of his paintings from this era and the following few years included the figure of his small son Woody. They often radiate the feeling of a child discovering, for the first time, the wonderful world around him. As this refreshing sabbatical neared its conclusion, Dike was reluctant to return to film making. There was an opening at the Chouinard Art Institute for a painting instructor which the school was hoping he would fill. After careful consideration he accepted this job and never returned to the Disney Studios. By the mid-1940’s Phil Dike’s name and the California style of watercolor painting had become synonymous. Although he was one of the leaders of the California group, Dike was trying to remain low key. While he appreciated the public’s growing interest in his art, he also valued his privacy, preferring to let his work speak for itself. In the mid 1930s Southern California was giving birth to another art form; full-color animated cartoons and feature films. Walt Disney Productions had been able to obtain exclusive rights to have animated color film developed, and for several years was the only company in the world producing this product. World-wide fame came immediately and with it, public expectations for a top quality product. Many thousands of first rate drawings and watercolor background paintings were needed for each film and it was imperative that every artist on the staff had special instruction in this area. In 1935 the Disney Studios hired Dike to teach advanced drawing and composition to some of the artists, and to check final drawings and background paintings. Occasionally, Dike produced art works which were included in feature films like Snow White and Fantasia, but for the most part, he was in charge of quality control. On the Fantasia project, he was one of the chief color coordinators and throughout production he made many important decisions relating to the meshing of various sections of the film. During the war years, Disney became involved in the making of propaganda and war-training films for the military. The responsibility for screening these films rested solely with Dike and Walt Disney. It was a job that proved “too much for Phil,” Betty Dike explained. Dike took a leave of absence and with Betty and their four year old son, Woody, headed for the desert and a miniature Shangri-la called Sven-Ska.